Corporate housing Toronto is a staple in the city these days due to relocating business people. Since trips like this can last longer than you wish, it’s better to stay in a relaxing place like the Hudson. 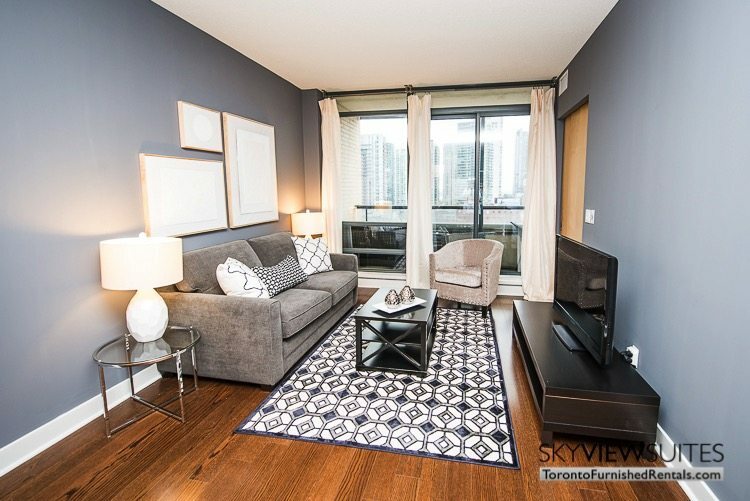 This open concept one bedroom plus den unit totals 730 square feet and includes a 90 square foot balcony. The most impressive feature of this suite is the 9 foot high ceilings and the windows which are floor to ceiling; they really brighten up the space. There is a gastronomic kitchen with granite countertops, stainless steel appliances and every utensil think able on hand. Looking over the island you see the dining room which seats four on elegant furniture. There are hardwood floors laid throughout the unit. The living room flows out of the dining area and includes a cozy couch and a TV. Outside, there is a balcony which overlooks the lake as well as downtown. There is a semi-enclosed den, which can be used for additional sleeping space if need be. Fortunately, there are two full bathrooms with marble finishes and luxurious towels. The bedroom has a queen sized bed laid with 300+ thread count sheets, an upholstered headboard and heaps of storage space. Additionally, there is a laundry duo inside the suite so you can wash and dry your clothes. The sheets and towels will be cleaned by the bi-weekly maid service which is included in your stay. Another benefit of staying in a Toronto corporate apartment is the free wireless internet. A boutique condominium located in the core of downtown Toronto’s theatre district. With exceptional finishes, the Hudson’s style mirrors the inventive and modern detailing accomplished by one of Toronto’s top interior decorators. Its amenities are outstanding and unmatched by most buildings standards in the heart of downtown. The gym facilities include a steam room in each locker room, while the party room is finished with exquisite details it turns into the perfect oasis for entertaining. Not to mention a gourmet kitchen, this can be reserved for cooking up a storm. Furthermore, there is a contemporary media room excellent for movies, and an individual billiards room for added fun. The outdoor terrace has a peaceful fountain and outdoor BBQs for all your grilling needs. This building happens to be located at the corner of King and Spadina, just steps away from Toronto’s Princess of Wales Theatre, the Royal Alexandra Theatre: theater heaven. Not to mention the bottom of the building is home to a food market with organic products as well as quality ingredients for gourmet chefs. Speaking of which, some of the best restaurants in Toronto surround this edifice. 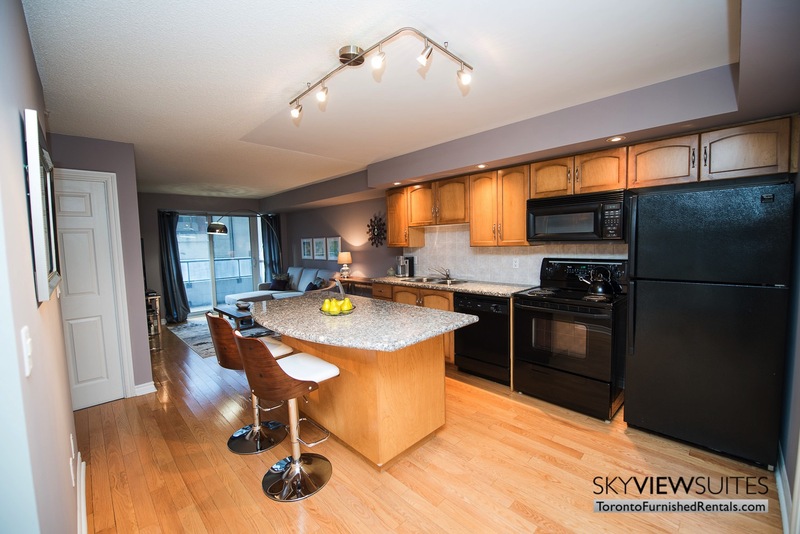 To make your Toronto accommodations at this unit, click here: Furnished Rentals.